Last year, 4.7 million people visited Grand Canyon National Park. The huge bulk of these visited the park's South Rim, easily accessible to the sweeping hoards coming up from Phoenix and such points. This travel season it's likely you won't get a campsite for your RV for love or money, at least not without an early reservation. The campgrounds at the park's main entrance north of Williams are just too popular. Here's a word to the wise. Your intrepid travel writers of the open boondocks spent several happy days and nights camped out just a raven's wing away from the South Rim entrance station. We paid nothing. We heard almost nothing. We saw very few folks. What's the secret? Boondock in the Kaibab National Forest, which girds the National Park's loins. 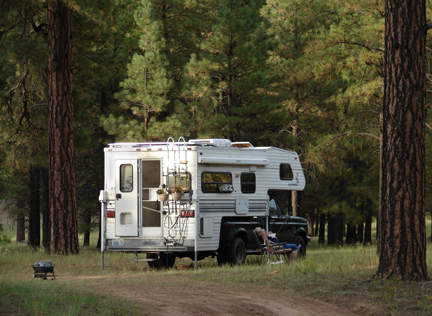 There's lots of good camping not far from the crazy crowds at the Rim, and Uncle Sam invites you to stay for no fee. You can 'spy out the land' using Google Maps -- just put in Tusayan, Arizona, as your starting point. Zoom in until the town's details start showing up. You'll find the Grand Hotel at the Grand Canyon just east of Highway 180, the main highway running from Interstate 40 up to the big trench in the earth that is the truly Grand Canyon. Behind the hotel (to the right or east) is a road labeled "302." That's Forest Service road 302, just one of many roads snaking through the forest near Tusayan, but this one could be the closest to the park's entrance. If you want "quick access" to the park, just drive on past the sign that tells you camping is allowed 'beyond this point.' You'll be less than a mile from the highway, in easy reach of fuel, shopping, and plenty of noise pollution. We made the mistake of pulling off at the first fire pit rings we spotted coming in the 302 road. We had the folding chairs out, the awning unfurled, and a bit of firewood gathered in time for the noisy swarms to begin buzzing the camp. We aren't talking mosquitoes here, folks. These were big mechanical birds that give environmentalists fits: scenic helicopter flights. Apparently those first tempting campsites are right on the main flight line. We managed the noise for a little over an hour, hoping it might shift. It didn't, so we did. Follow that main forest service road north, then follow it more as it bends east, and keep your eyes peeled. You'll find a variety of little pull-out spots heading off into the woods and meadows that make up this part of the Kaibab National Forest. We found ourselves seven miles east of Tusayan, in some of the quietest country we've landed in for a long time. Yes, a few vehicles run up and down the road, but compared to most places, it's like paradise restored. We did find we had to take a little caution with the local wildlife. Our traveling houseplants were soon off the rig and out in the sun. Our hanging flower pots were in a famous place -- hanging off the roof access ladder. And my favorite pot of "Hen and Chicks" were soon installed on the ground under the hanging pots, all the better to catch the excess "runoff" water. 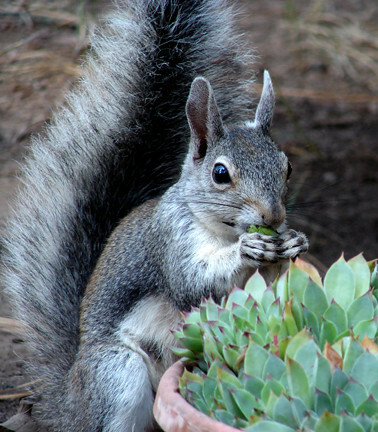 But by Day Two, our little bit of paradise was likewise discovered by a wayward squirrel -- who discovered a whole new world of flavor in those succulent "Hen and Chicks." The Wife Unit thought the little marauding rodent was a gas as he selectively picked his way through my baby greens, but Mr. Squirrel was soon thwarted when the Hen and Chick family was relocated to the hood of the truck. There are months of wonderful camping weather just ahead of us. Just be sure you keep your potted peonies secured from rodent rage! Thanks for the info! One question.... after easily finding 302, I was unable to determine exactly where to find these campsites. After you went 1 mile east on 302, and decided to move due to noise, you said to "Follow that main forest service road north, then follow it more as it bends east." But 302 doesn't go north and then east. Which "main forest service road" were you referring to? You can follow unnamed forest roads from there until you end up at a spot nearly 7 road miles East of Tusayan, as you described your final location (identified on the map as "Halfway Trick Tank), but it's hard to tell from the satellite view if there are any campsites there or if this is indeed the location you were referring to, especially since it wasn't accessed by driving "North then East." Any chance you could provide GPS coordinates of the spot you camped so we don't end up stuck in the woods in a big rig? Speaking of which, is this an appropriate place to take a 40-foot motorhome towing a car? Peter: There aren't any real designated "sites" as such. This is dispersed camping, and our best advice if you have a motorhome with a toad is to pull just off the highway behind the hotel -- there's a large area back their suitable for parking. Unhitch the toad and do a little exploration up the line until you find a site that meets your needs. I'll have to grab a few coordinates on this summer's tour if we can work it into the schedule. Thanks for your comments. Thanks Russ & Tina! And thanks again for the great article. Russ, that's a great "scoop", and you might want to check out my blog posts about the NORTH rim areas that have similar opportunities. At the north rim (actually formally the East rim), you can park your RV within 50 feet of the edge of the Canyon. Thanks for the great info, I'd like to see GC but don't care for crowds. If you don't like crowds, then by all means, visit the North Rim. Stunning views, but a lot less people. My son & his family plan to visit as many of the National Parks next summer as they can in a 6-week period. They'll be towing their 27-ft travel trailer. My 10-yr-old granddaughter is especially excited about seeing Grand Canyon. I'm sending this wonderful post to them right away. Thank you for this info!